The recent decision of the Delhi Metro Rail Corporation’s (DMRC) to hike metro fares in the capital has ignited controversy, with the Delhi state assembly instituting a committee to examine the issue . Last month, it was the suburban railway management in Mumbai that came under fire from opposition politicians after a stampede at the Elphinstone station in the heart of the city claimed the lives of 23 people. The two events may seem unconnected but both are symptoms of a systemic crisis in India’s urban transport infrastructure. As our cities expand, existing urban transport infrastructure is proving to be inadequate. The situation is particularly severe in big cities. Despite a large commuter-base, public transport providers are not able to recover their costs. Mounting losses in turn often cripple the ability of such service providers to invest in infrastructure, and even to meet basic safety requirements. This year alone (till the month of August), 410 people have died in accidents in Mumbai’s railway tracks. Mumbai’s suburban rail network bears a share of the blame but it is worth noting that this rail network in particular bears an abnormally high load. Traffic congestion in the city’s roads and the lack of alternative mass transit systems has meant that the railway network bears the brunt of the rush hour traffic. According to the 2011 census, one in six Indians who take a train to work live in Mumbai or its suburbs. These statistics are for the other workers category, which includes all workers except cultivators, agricultural labourers and household workers. Mumbai is way ahead of Delhi, Kolkata and Chennai on this count. According to a statement by former railway minister Suresh Prabhu, subsidised rail-fares had caused a loss of Rs3,394 crore to the Mumbai suburban railways in the three years ended 2014-15. Things may seem better in Delhi’s case but even DMRC is a loss-making enterprise. DMRC incurred a loss (before tax) of Rs348 crore in 2016-17. The figure was Rs470 crore in 2015-16. Mounting losses for the DMRC, if left unchecked, are bound to have an adverse impact on service quality and even future expansion plans. Are politicians like Arvind Kejriwal being obdurate in opposing a fare-hike then? The answer is not quite straightforward. Delhi Metro connects the heart of the city with its outer-most fringes. A majority of Delhi’s manual labourers live in the outskirts. The daily wage rate for unskilled (skilled) manual workers is Rs470 (570) per day in Delhi. After the latest fare hike, anybody travelling more than 32km would have to pay Rs60. An unskilled manual worker, who is likely to be travelling such a distance for work would lose one-fourth of his or her daily earnings on travel expenses. This is bound to have a devastating impact on his or her household finances. It is hardly surprising that Kejriwal sees a political opportunity in opposing metro fare hikes. But politicising such hike decisions also creates the risk that public sector transport agencies will continue to bear losses, and will have to perennially depend on subsidies to run their operations. In a 2015 Economic and Political Weekly article, R. Nagraj, professor of economics at the Indira Gandhi Institute of Development Research, argued for regular indexation to incorporate rising input costs while pricing services such as public transport. Delhi metro fares have been hiked twice this year. The previous revision was done in 2009. Had the fare price revision been done on a more regular basis, it could have been made politically palatable even while ensuring economic viability of the metro project. To be sure, the crisis in urban transport is not just about the absence of a rational pricing policy. It is also related to the manner in which cities have expanded in the country. 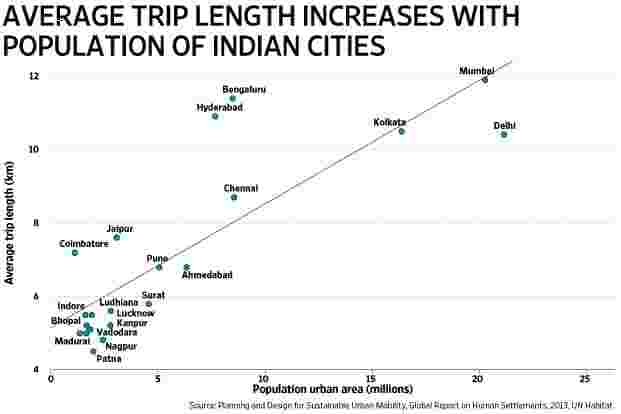 A 2013 UN Habitat report shows that as populations of Indian cities rise, the average commute tends to rise correspondingly. This according to the report is a result of redirecting growth to the outskirts of cities. While it has helped reduce traffic congestion at the core, this has also resulted in very high dependence on motorized transport. The rich have responded by increasing use of cars and cabs. The non-rich are either travelling in virtual death traps or struggling to save their meagre earnings from growing expenses of public transport.